DALLAS—In an effort to make himself more appealing to voters, Sen. Ted Cruz (R-TX) reportedly tried to connect with the audience at a candidate forum Tuesday by wearing the bloody, skinned face of a far more handsome man as a mask. “People are really responding to this new, dapper Ted Cruz,” said campaign manager Jeff Roe, noting that recent internal polls show that since Cruz adopted the new look, voters are twice as likely to describe the expressionless, gore-covered incumbent as “trustworthy,” “affable,” or “charming.” “That rough-cut mask of rotting skin is doing wonders for the senator on the campaign trail. He’s honestly never looked better, and the voters are really beginning to take notice. Even with the stench of decomposition, most people we talk to remark upon how Sen. Cruz doesn’t make them feel as nauseous as he used to. 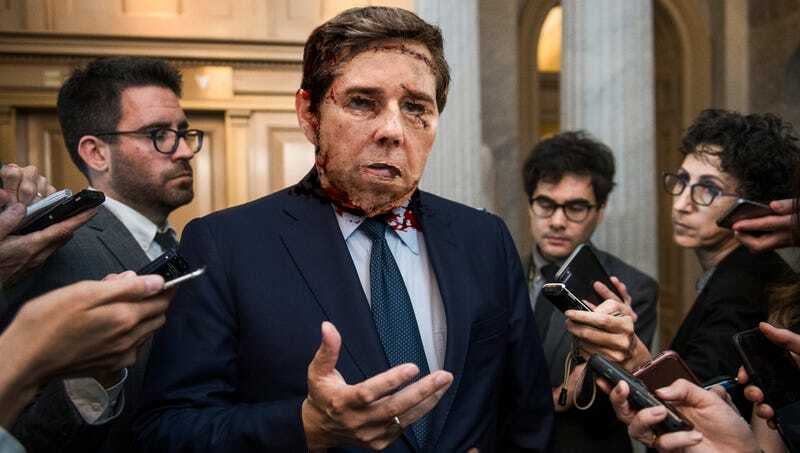 He’s looking a lot healthier, too.” Roe later confirmed that while Cruz’s current mask was rapidly decaying, the candidate had a freezer filled with enough handsome and blood-encrusted masks of human skin to last him through the campaign’s final stretch.